Septuagenarian senior citizen, and perpetual Rolling Stone drummer Charlie Watts was born 75 years ago on June 2, 1941 in London, England during World War II. As a boy Charlie Watts and his neighbourhood friend Dave Green were jazz fans; Charlie's parents gave him a drum kit in 1955 and both he and Dave began playing in the Jo Jones All Stars jazz band in 1958 at the age of 17. After leaving Harrow Art School (University of Westminster) in 1960, Watts began working as a graphic designer by day, and played drums at night. He continued to hone his drumming skills in rhythm and blues clubs during a stint as a drummer for the band Blues Incorporated in 1961 and 1962, where he first met musicians Brian Jones, Mick Jagger, and Keith Richards. Watts was already dating Royal College of Art sculpture student Shirley Shepherd when The Rolling Stones asked him to join their band in 1963. 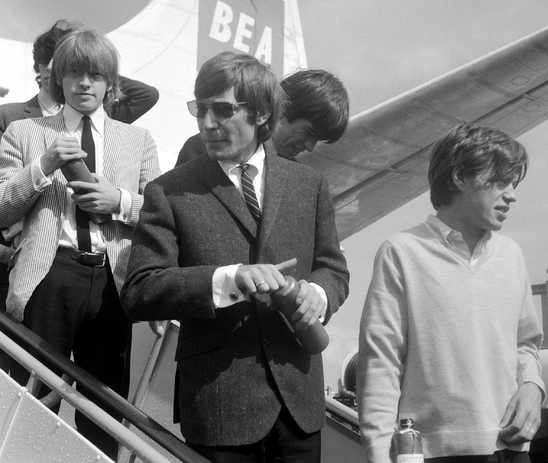 Below, Charlie Watts in sunglasses with his Rolling Stones bandmates - frontman Mick Jagger on the far right and guitar player Brian Jones on the left. In the early years with The Rolling Stones, in addition to playing drums, Watts also put his graphic design skills to use in designing some of the early Rolling Stones album sleeves and stages for tours. Shirley would often go on tour with the band. Charlie Watts quietly married girlfriend Shirley Ann Shepherd in October 1964 and their daughter Serafina was born in March 1968. such a long-standing marriage in a rock and roll band, especially The Rolling Stones, stands out as a remarkable exception to the norm. Reportedly Watts has never indulged in affairs during his marriage, turning down groupies while touring. Watts has said that for a three year period in the mid 1980's, he struggled with and overcame, problems with alcohol and drug use that almost ended his marriage. Despite being in perhaps the biggest rock band of all time for the past 50+ years, Watts is a steadfast jazz afficionado and has also toured and performed with other boogie-woogie, jazz and big bands. He's performed on and recorded nine non-Rolling Stones albums since 1986, most of them as The Charlie Watts Quintet or a version thereof. Charlie and his wife Shirley began owning and then breeding world-class Arabian horses in the 1980's; in 2013 they owned well over 200 horses. In 1996, Charlie's daughter Serafina Watts made him a grandfather in his 50+ years, when she gave birth to his granddaughter Charlotte Watts. A smoker until the late 1980's, Watts was diagnosed with throat cancer in 2004 and underwent radiotherapy; he's been in remission ever since. 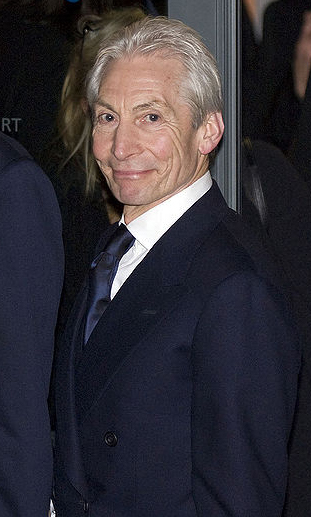 A couple of years later in 2006, Modern Drummer magazine voted Charlie Watts into their Hall of Fame in 2006. Shirley and Charlie Watts are still married today and will celebrate their 48th wedding anniversary in October 2016. When not recording and touring with The Rolling Stones, septuagenarian senior citizen Charlie and Shirley live near Dolton, England and their 600 acre, prize-winning Arabian horse stud farm (Halsdon Arabians).